Managing your current and potential clients begins with entering a client's contact information in the New Company screen. Here you can compile a list of all clients, their preferred contacts, billing and shipping addresses, general financial information, and any other User-Defined Fields you wish to include. The compiled information about companies is accessible throughout Control, when entering in estimates, orders, payment entry, and scheduling activities. You may also research companies with Explorer. A company is any prospective or current client, active or inactive. Companies may be individual people or corporations. Active companies are those who are currently using services. You may also save a potential or previous client's information by classifying it as inactive. Doing so will retain that company's information while excluding that company from the ordering process and activities. Company Name – Type in the company's name. 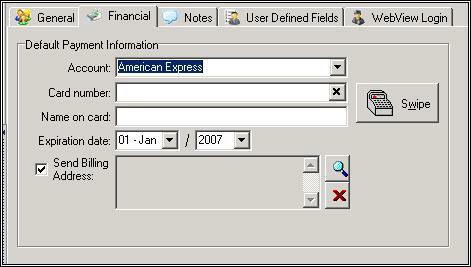 The Check Name box to the immediate right of the name field prevents duplicates among company names. Control will not allow you to store two companies with the exact same name. Active – Active companies can place orders. Their activities will appear in order, estimate, and service ticket entry screens. Inactive companies cannot place orders, nor can they have activities assigned, therefore, they do not show up in those screens. Inactive companies only show up when you search Explorer for inactive companies. Pricing Level/Promotion – Select the company pricing level from the drop-down box. Pricing levels may be set to a higher or lower percentage of the base price. Pricing levels allow you to charge a certain rate for individual companies. This information is concealed from your salespersons and your company. 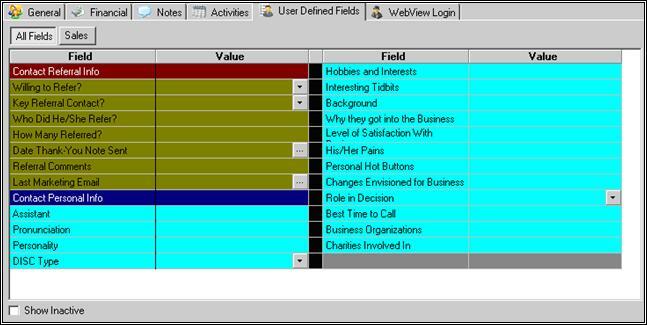 Primary Salesperson – Assign up to three salespersons in this section. Industry, Origin, and Region – Drop-down boxes with common selections. To add your own selections, select the New option from the drop-down box to reveal an entry screen. Billing and Shipping Addresses – Once you have entered a billing address, it will be the shipping address unless you enter a new shipping address. To enter an additional shipping address, select the New button. You also have the option to ship to the billing address by selecting the Use Company Billing Address button. This will appear once you have entered the billing address. The Mapquest button provides a street map and driving directions to the address. Telephone numbers – You must enter in an office contact number to save the company's information. Flags and Notes – Other specific information about the sub group. These notes are visible only to persons authorized to access the Employee Setup. Flags pop up when you open and edit a company's order screen. To enter flags and notes, simply type in your desired notes or select from the speed notes section. You can also use the Add button to create flags and notes using merged fields. Speed Notes – Other specific information about the sub group. These notes are visible only to persons authorized to access the Employee Setup. Speed notes save time by listing several common notes from which you can choose, rather than creating your own text. To add a Speed Note into the flags or notes box, either double click on that note, or highlight it with a single click and select the Add button. Pricing Plans – Select a previously specified pricing plan. Use the drop down box to make your selection. P.O. Required – Some companies require purchase order numbers for their internal verification purposes. When this box is checked, this tells Control that this field must have a value in order to save an order for this company. Tax Class – Select the default tax class for this group. You can select from city, county and state tax classes. Tax Number/Exemption – These classifications will apply to all the company's transactions. Division – A division is a group of employees that you wish to keep separate for documentation purposes. A division is part of a company and can consist of both employees and sub groups. Export – Exports the displayed information for use in another program. Save – Saves all entered information. Cancel – Disregards changes and additions made to a record. For each company, you may specify one primary contact and as many other contacts necessary. Be sure to check the Primary and Billing checkboxes for the appropriate contacts. You can enter specific information about the company here. For instance, the contact ordering the product may be located right down the street from your shop, but their accountant is located at their franchise headquarters in Sacramento. Add – Press to add a new contact to this company's record. Delete – Removes a contact from the company record. Clone – Copies a pre-existing order, estimate, or product to a new record. Active Contact – This option is available after you have entered a company name and designates the contact as active. Inactive contacts will not appear in order screens, but they will appear in that company's record until you manually delete them from this screen. Primary – The primary contact is the default contact to appear on new orders and estimates. Billing – Main person to contact for invoicing and payment purposes. Full Contact – This person is a full contact for the company. Limited Contact – This person is a limited contact for the company. Position – Enter this person's position at the company. Use Company Salespeople – Check this box to use the default salespersons you have designated for this company. Birth date – The contact's birth month and day. Some companies like to send top customers birthday cakes or cards. Email – The contact's email address. Phone numbers – Enter up to three phone numbers for each contact. Addresses – You can specify a shipping address and a billing address. Open – Open a record. 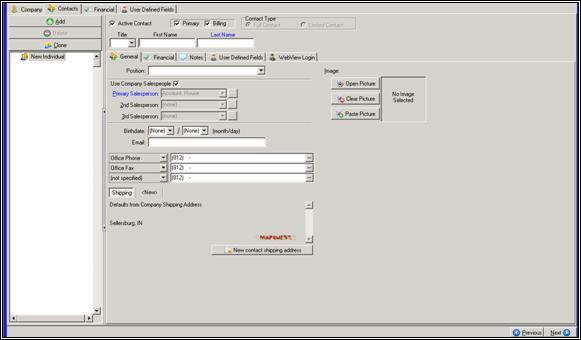 Print – Prints the selected order, estimate, company, etc. Create Order – Creates a new order. Contact Options – Expands to provide the option to Edit UDFs or add another user. Activities – Expands to create an email, note, call, appointment, meeting, to do, or work assignment. This sub screen appears for each contact entered for a company. Each contact can have different information from the others. 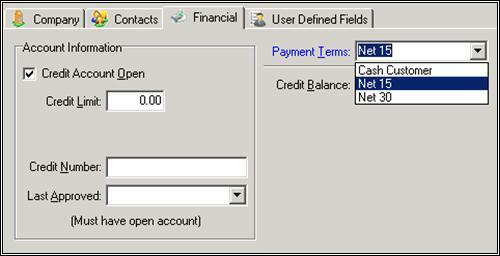 Account – Designate the type of payment this contact typically uses. Selecting Check will prompt you to enter in a check number. Selecting a credit card type will reveal a form to enter in the credit card number, expiration date, and billing address. You may alternately choose to swipe a card through your own card reader to enter the information. There are also options for refunds, eChecks, wire transfers, and trade barters. This sub screen appears for each contact entered for a company. All contacts can have different information from the others. The Notes sub screen allows you to enter in additional information about each contact. This information remains here as a reference; it does not appear in other portions of the program. This sub screen appears after someone in your company has had contact with this particular contact, such as a phone call or an order being created. You may designate certain pieces of information that you wish to know in an organized fashion for all contacts under each company. If the customer uses WebView to access their orders online, this is where you will set up their IDs and passwords. Add User – Click to create the User's WebView ID and password. Delete User – Click to deactivate the User's WebView access. Once you have created a WebView ID for this contact, their username will show on this screen. Credit Account Open – Activate credit limit fields. Credit Limit – Specify the company's credit limit. This amount will appear during a transaction if the pre-determined amount is exceeded. Credit Number – Create one for your company's specific credit authorization information. Last Approved – Enter a date in this box per your company's procedure. Payment Terms – If a credit account is set up, you must also specify payment terms. 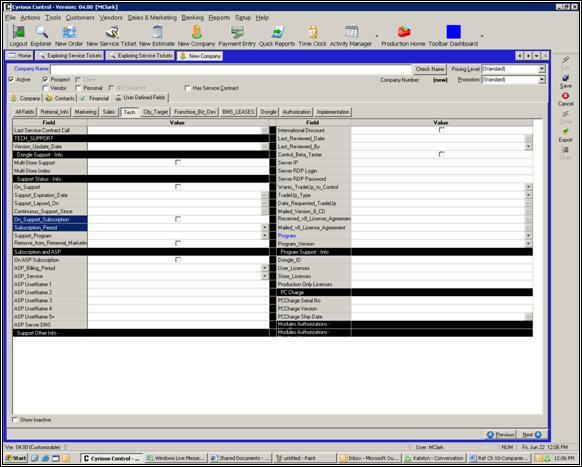 The drop down box provides options for cash and Net 30-90 plans. Credit Balance – The amount the customer has available to spend. Has Service Contract – If checked off, all other fields are required. Use the drop down boxes to designate the contract type, start date, and expiration date. Use the Notes box to add internal notes about their service contract. You must enable the Service Contract tab through Setup. Control does not allow duplicate company names by default. Forcing unique names for all companies prevents losing or confusing orders for companies with similar names. If necessary, you can elect the permission of duplicate names. This option can be found under the Company section in the System Setup. Cyrious allows you to save as many company contacts as necessary for a company. You will retain a default primary contact for each company; however, the management of multiple employees and contacts further organizes complex networks of contacts and actions. 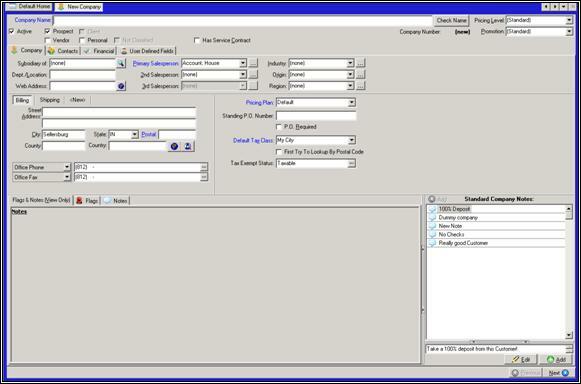 This allows you to assign multiple employees to multiple company contacts. Control allows you to enter in multiple addresses for each company, as well as for each individual contact. The billing address for the company is the primary contact address for that company and any of their contacts, unless otherwise specified. The House Account is the default primary salesperson for a company. However, you can choose to label an individual employee as a primary salesperson for a company, or for an individual contact within a company. The primary salesperson will show up by default when entering orders and estimates. In the company screen, you may choose to put up to three of your own employees as salespersons for that company.